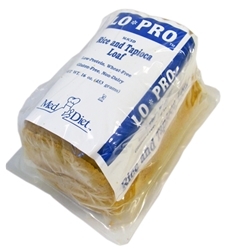 A "sandwich bread" that is thinner, less sweet and lower in Calories than Lo*Pro Rice Starch Bread. Ingredients: filtered water, rice flour, tapioca starch, high oleic safflower oil, pear juice concentrate, bamboo fiber, yeast, methylcellulose, guar gum, orange citrus fiber, salt, calcium phosphate, sugar cane fiber, baking powder (glucono delta lactone & calcium carbonate). Enriched with thiamin (Vitamin B1), riboflavin (Vitamin B2), niacin, iron, folic acid and Vitamin D.